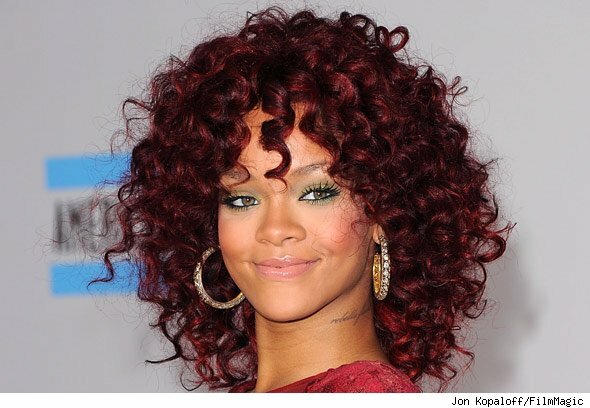 Rihanna’s cherry curls… simply delish! She premiered them at the American Music Awards, and we hope she sticks with them longer than normal. Watching her hot singing/dance acts, we flashed back to Whitney Houston in happier days (right). We don’t remember the older singer going with a rich red like Rihanna’s but the ringlets and the cuts have a lot in common. Girls who wear curls can appreciate a good layered haircut. Talented hairstylists know exactly where to snip spirals so that they frame the face instead of overwhelming it. The layers also add bounce to curls that can be weighed down by too much length. Compared to straight hair, it’s harder to make curly locks shiny but highlights, salon treatments and shine-enhancing products can be a big help. Or take a cue from the stars: use hair extensions, pieces or wigs to turn on the shine. If Rihanna’s ringlets aren’t your thing, just wait for her next do-over… it’s only a matter of days! This entry was posted in Music, star styles that work in real life, TV and tagged AMAs 2010, American Music Awards, curly hair, dark red hair, layered haircuts, Rihanna, Whitney Houston. Bookmark the permalink.